Nearly all of the different types of chocolate available in most supermarkets can be used in baking. The main difference between the various types is whether or not the confection is sweetened. In general, what is traditionally known as baking chocolate is unsweetened or very lightly sweetened while chocolate for eating is sweetened. Baking chocolate is pure chocolate without any added ingredients. Other chocolates sold for eating contain sweeteners, flavorings and even other ingredients such as nuts, dried fruits, herbs or spices. Chocolates marketed for eating are sold in fancy packages that contain thin bars, usually about 2 or 3 ounces, and you can expect to pay more for this kind of chocolate. The two main types of baking chocolate are unsweetened and bittersweet chocolate. Unsweetened chocolate can be found in the baking section of most supermarkets and is usually sold in packages containing eight 1-ounce squares. Though bittersweet chocolate has some sugar added to it and can be purchased for eating, it often comes in thick 1-ounce squares and is also sold in bulk specifically for baking purposes. Baking chocolate is made from cocoa nibs that have been milled and then formed into a paste. The paste is approximately 50 percent cocoa solids and 50 percent cocoa butter; however, the cacao content is 100 percent, meaning no sugars or other ingredients are added to it. Bittersweet chocolate contains closer to 35 percent cocoa solids and 67 percent cacao. Semisweet chocolate can be purchased for baking, but it is sweet enough to be eaten straight out of the package. Though it is sweeter than bittersweet chocolate, the two can be used interchangeably in recipes. If you prefer bittersweet chocolate and only have semisweet chocolate in the house, consider reducing the amount of sugar slightly in your chocolate recipe. Semisweet chocolate is available in chips, bars and 1-ounce squares. Semisweet chocolate is the most popular chocolate used in making chocolate chip cookies. German's Sweet Chocolate is sweeter than other baking chocolates. 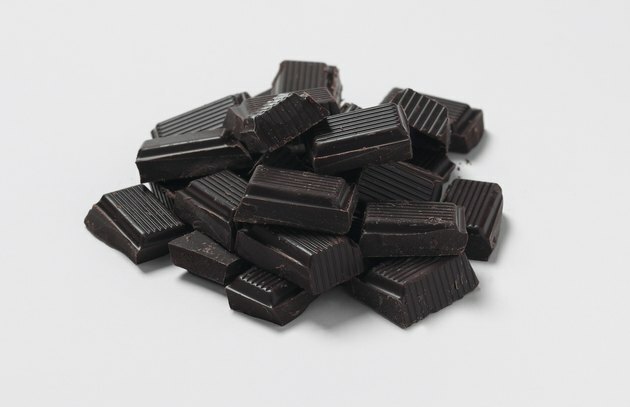 The dark chocolate contains 46 percent cacao, which is similar to bittersweet chocolate, but it contains more sugar. German's Sweet Chocolate, now a Kraft brand and part of its Baker's Chocolate line, was created by Samuel German. He thought adding sugar to the chocolate would be more convenient for bakers than using unsweetened chocolate. It terms of sweetness, it is sweeter than semisweet chocolate. German chocolate is used most often in making German chocolate cake -- which is not a dessert specialty from Germany, but is name for the brand of chocolate used in the cake. Though used less often than other chocolates, milk chocolate is available in chips and blocks for baking as well. Milk chocolate is sweetened and has milk solids added to it, increasing the fat content while decreasing the cocoa content. Though is contains no actual cocoa, white chocolate is also available in chips and blocks for baking. Of all the chocolates, white chocolate is the sweetest; it has cocoa butter, but no cocoa powder. Both white and milk chocolate can be used in the same ways as bittersweet and semisweet chocolate.